I always enjoy making birthday cakes for family and friends. It’s a process that begins by searching for something that’s impressive enough – which of course is likely to involve buying a new recipe book – and continues by having to purchase a long-desired and never to be used again vital piece of kitchen machinery and / or other peculiarly specific bit of equipment. And in order to make something that’s worthy of presenting to someone so special, you’re pretty much compelled to produce a final creation that contains more calories than you should probably consume in a month, let alone in one slice of dessert. But – and this is the best part – because it’s a totally selfless mission, all of it (including the new book(s), kitchen gadget and ridiculously high fat content) can be done completely guilt free. This year – unfortunately – I made the mistake of actually bothering to ask my husband what kind of cake he’d like for his birthday. Hmmm. With great delight, relish and optimism I suggested that he look at Lily Vanilli’s new recipe book Sweet Tooth, hoping that he’d select something particularly exciting for me to make. But sadly he declined, requesting instead something rather more modest, and which demanded absolutely no new kitchen equipment at all. 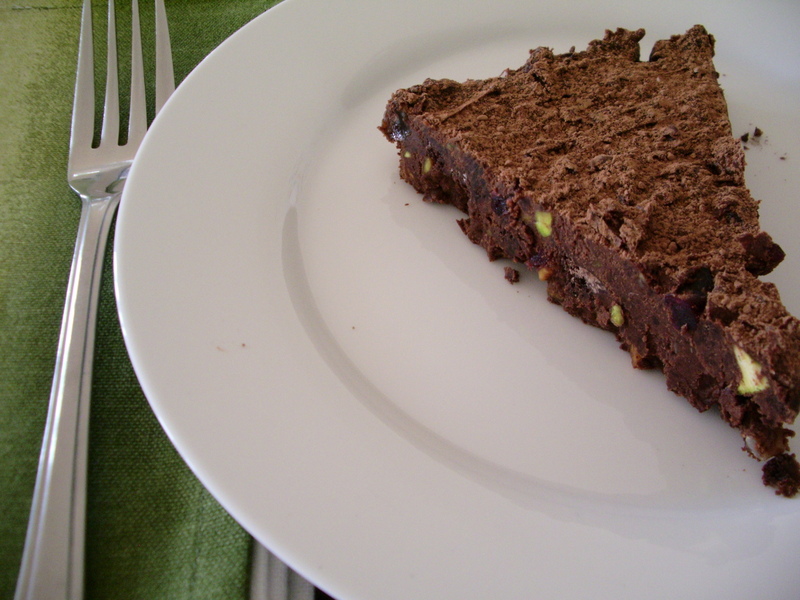 But this chocolate torte, with dried fruit and pistachios, is one of his favourite desserts (even if he did describe it as ‘that fabulous chocolate thing with the green bits in it’), and as such was totally perfect for his birthday celebrations. It also tastes absolutely divine, is extremely easy to make – actually requiring no cooking at all – and probably still contains a ridiculous amount of calories. And it goes really, really well with whipped cream. The original recipe isn’t gluten-free, and includes sweet oat biscuits instead of the gluten-free dark chocolate biscuits that I used, but this was an incredibly straight-forward substitution that worked well. Begin this the day before by soaking the dried cranberries and raisins in the Marsala overnight. 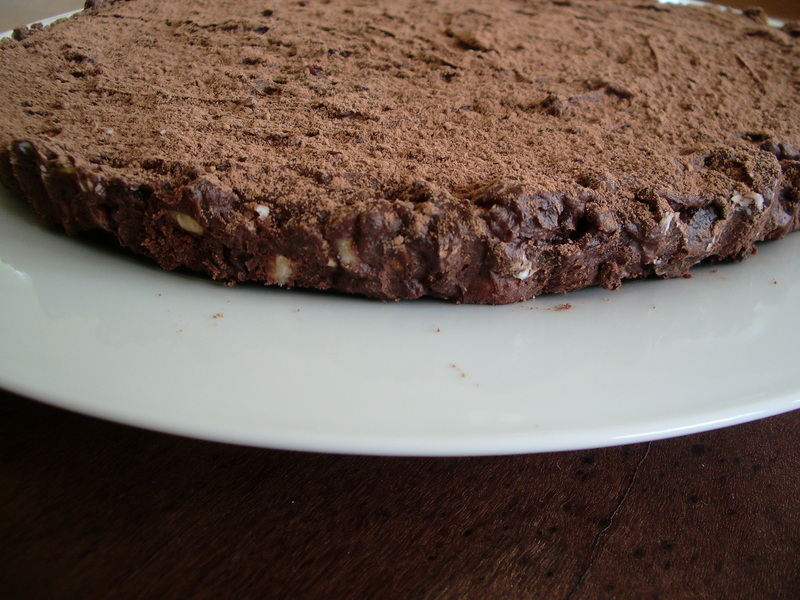 To make the torte, place the broken-up chocolate and butter in a large heatproof bowl, which should be sitting over a saucepan of barely simmering water, making sure the bowl doesn’t touch the water. 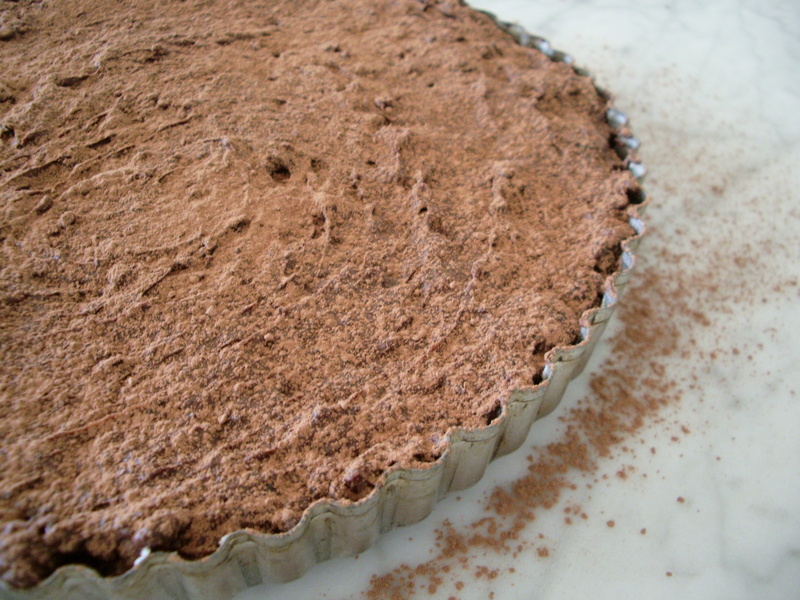 Then, keeping the heat at its lowest, allow the chocolate to melt – it should take about six minutes. Remove the bowl from the pan, give the chocolate a good stir and let it cool for 2-3 minutes. Next, fold in the whipped cream, followed by the soaked fruits in rum, the pistachios and chopped biscuits, and give it all a good mix. Finally, spoon it into a loose-based cake or flan dish with a diameter of 8 inches (1 ½ inches deep), lightly greased with a flavourless oil. Push it out as evenly as possible using the back of a spoon. Cover with clingfilm and chill for a minimum of four hours. 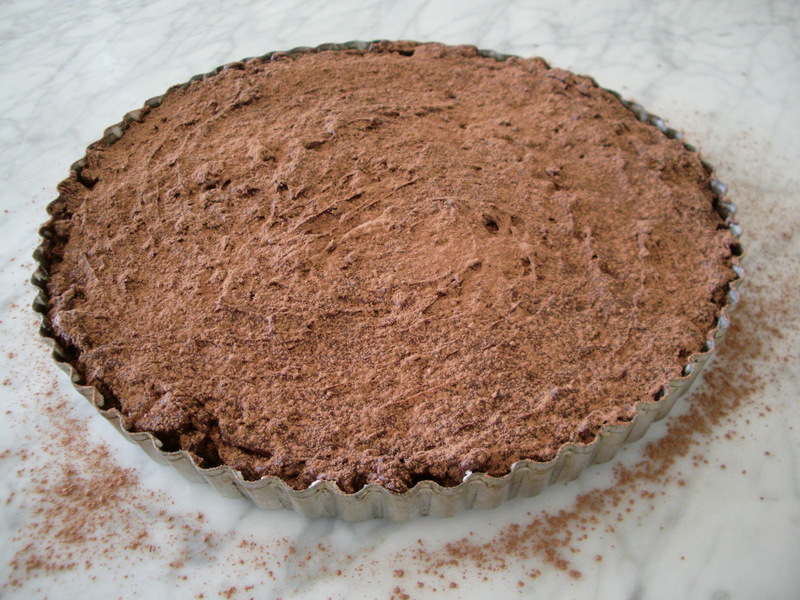 To serve, dust the surface with some cocoa powder, cut the torte into wedges, then serve with crème fraiche, whipped cream or pouring cream. 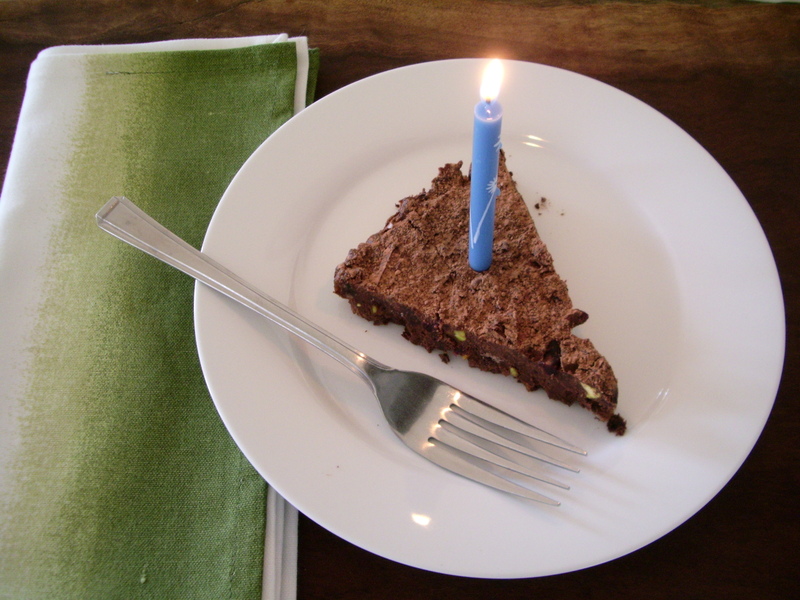 This entry was posted in Food, Recipes, Sweet things and tagged birthday cake, Chocolate, easy, Gluten-free. Bookmark the permalink. Thank you! It really is good – and so simple to make as well. Perfect! That looks out of this world….wow! I so need to make this!! Thanks! I’d certainly recommend it! Hey Becs! Absolutely – and I’m sure that the kids would have a great time ‘helping’ you to make it too! Thanks! It is very appetizing – and certainly never hangs around for long!